Most Daily Telegraph readers are of course far too young to remember the summer of 1976, but for some of us it was a critical moment in our adolescence. It was so hot that a certain au pair girl decided that her bikini was a stifling encumbrance, and one lunchtime she turned up with nothing on at all, a dress code that was instantly copied with stunned approval by everyone else. Soon our valley in Somerset was fabled as a kind of nymph-strewn Arcadia. People started to cadge invitations to see our au pair, and across the nation we British were briefly seized by the same deeply embarrassing tropical madness. There were streakers at Piccadilly and streakers at Lord’s, and no wonder. Since headlines on the 8th July when G8 leaders announced a $28 .8 billion ($50 billion) aid package and debt of the 18 poorest African nations cancelled, what progress has been achieved? Yesterday’s ID select committee at which the Secretary of State for International Development gave evidence sheds a few clues. As a reward for the countless eager readers and contributors to Boris’s site every day, we’ve taken a step forward and launched a new website design – and hopefully you’ll see the benefits in the coming days. The site now looks a lot cleaner and to give you a broader view of Boris’s work you can see related entries alongside each entry. In the next few days, we’ll be tidying up any edges and adding a few new features, including an improved Photo Gallery. Let us know what you think! If we were Israelis, we would by now be doing a standard thing to that white semi-detached pebbledash house at 51 Colwyn Road, Beeston. Having given due warning, we would dispatch an American-built ground-assault helicopter and blow the place to bits. Then we would send in bulldozers to scrape over the remains, and we would do the same to all the other houses in the area thought to have been the temporary or permanent addresses of the suicide bombers and their families. After decades of deranged attacks the Israelis have come to the conclusion that this is the best way to deter Palestinian families from nurturing these vipers in their bosoms, and also the best way of explaining to the death-hungry narcissists that they may get the 72 black-eyed virgins of scripture, but their family gets the bulldozer. I have already had enough about how perfectly normal these young men were, and what charming fellows they were, and how there was nothing they loved more than serving in dad’s chip shop or helping an old lady across the street or a good game of cricket in the park. “All he wanted to do was have a laugh,” said one of the neighbours last night, about one of the sick quartet responsible for killing themselves and at least 52 others in London. “He was sound as a pound.” Yeah, right. If these four young men were perfectly normal Yorkshiremen, then what the hell is happening to this country? Of all the shattering revelations of the past few days, the worst has been that these suicide bombers were British. They were our very own. They were as British as a wet bank holiday. They were as British as Tizer, and queues and Y-fronts and the Changing of the Guard, and the chips that made them what they were. They were born in British maternity wards, and attended by every comfort that the state could give. They went to British primary schools and learnt about Britain from British teachers, and when they murdered so many of their fellow Britons it was the British emergency services who tried to save what lives they could. That shocking fact of their Britishness tells us something frightening about them and about us, because, as suicide bombers go, they are unusual. When the Palestinian bombers attack Jerusalem or Tel Aviv, they usually come from miserable lives in Nablus or Hebron. When the 19 suicide bombers destroyed the Twin Towers they originated, without exception, from the Arab world, mainly Saudi Arabia. Yesterday’s disgusting attack on London will naturally be seized upon by politicians of all hues to advance their various agendas. Opponents of the war in Iraq have lost no time in blaming Tony Blair and British engagement for the bombs that hit London and killed dozens and injured many hundreds. They have a point. As the Butler report revealed, the Government was explicitly warned before the Iraq war that our involvement would exacerbate the risk of terrorism in this country. But that does not for one moment mean that if Britain had not been involved in Iraq, then London would have been safe. It bears repeating that more British people died in the attacks on the World Trade Centre than in yesterday’s brutal outrages, and it must never be forgotten that 9/11 preceded the war in Iraq and the war in Afghanistan, as did the series of vicious Islamicist bombings in Paris in the 1990s. Which is to say that we in London, Paris, New York and the rest of the civilised West face a terrorist threat which cannot be said wholly to have been provoked by Iraq. These are people whose hatred of what they see as Western values is seemingly ineradicable. It is impossible to negotiate with them. Their grievance is not just with the war in Iraq or with the treatment of Palestinians by Israel but with the whole system of Western values that they find troubling and disturbing, not least the emancipation of women. We must tackle the terrorist threat with calm resolution and without recourse to wild or hysterical measures. Yet the Government will now seize on this event with no less vigour than their opponents to campaign for a series of repressive and illiberal measures of doubtful utility in the so-called war on terror. Prime among these is the compulsory ID card. It must be stressed that whatever the merits or demerits of an ID card system, it would have done absolutely nothing to prevent the horrors of yesterday. As with the 19 suicide killers of 9/11 the problem was of intention and not identity. In the coming days and weeks the public will urged to accept such restrictions on their liberty as ID cards as a price we must all pay for liberty itself. We believe that argument to be absurd and fallacious, and hope that defenders of liberty will recognise that it is exactly this kind of panic-stricken measure that will most gratify the killers. As far as I am concerned, Jacques Chirac can say what he likes about British food. He can slag off haggis. I hold no brief for haggis. He can even make jokes about mad cow disease, though souls angrier than mine might say that was pretty odious, given that French politicians assisted in the £5 billion destruction of the British beef industry, when they knew our cattle were perfectly safe to eat. Congratulations to David Dawson and his fantastic team in Henley – well done on your latest superb copy of The Henley Standard with a record-breaking 96 pages including a special Regatta supplement! 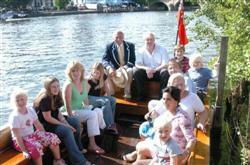 Also, this amazing picture of Boris and family enjoying a river boat cruise – in this week’s Henley Standard.